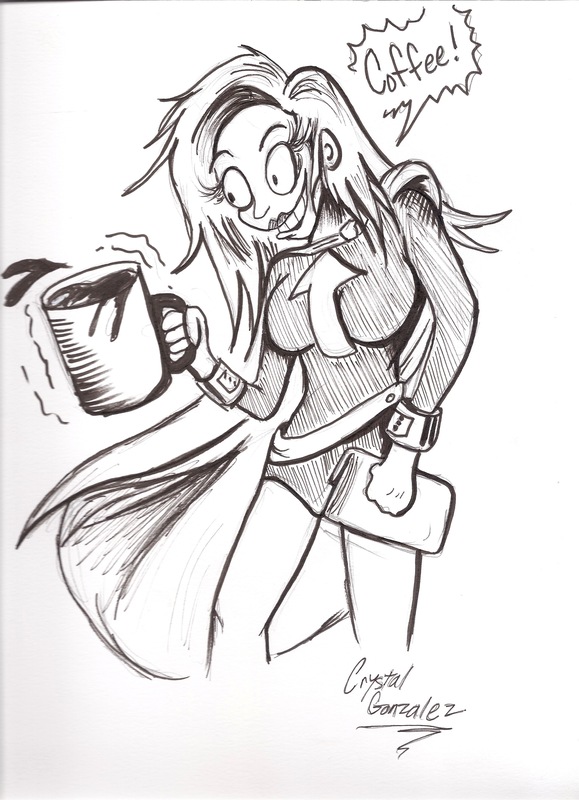 Crystal Gonzalez draws Super Holly LOVING coffee!!! At the PLCAF Small Press Comics Expo today, I bought a comic from Crystal Gonzalez: In The Dark. I had to find out what Super Holly would look like drawn by her. Her style is crazy, loopy, scary, funny, the characters want to leap off the page and stick to your face while screaming. So I had her draw Holly having coffee. Thank you, Crystal. I started reading your comic about the guy tossed into hell and trying to stay alive. It has coffee references. How fitting. This entry was posted in Uncategorized and tagged artist, coffee, comic book, Crystal Gonzalez, In The Dark, Super Holly, Super Holly Hansson by davemstrom. Bookmark the permalink.